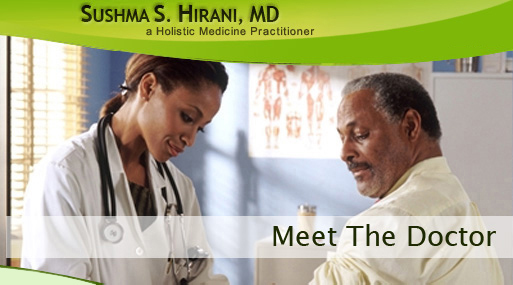 I am a board-certified family physician specializing in holistic medicine. My approach is to combine conventional and alternative care methods of treatment for various conditions. I prefer to use natural therapies such as diet and nutrition, vitamins, supplements, hormone balancing and emotional support and rely on pharmaceutical medicines only when necessary. I was raised in a close-knit family in New Jersey and attended medical school in India – a country known for its long history and rich tradition in ayurvedic and herbal treatments. I did my residency in Family Medicine at Wayne State University in Detroit, Michigan. I have a loving husband and two beautiful children. We share a love of traveling and the outdoors and have visited numerous places and seen different cultures. I began my medical career with goals of promoting wellness in my patients, educating them regarding their health, and treating their underlying problems - not just managing their symptoms. During the third year of my residency program, I took a one month elective course in Complementary and Alternative Medicine where I had a chance to work with medical doctors practicing alternative care. This was my first insight into this unique way of healing - a holistic approach in which the whole body heals from within resulting in long lasting health and wellness. It opened up my world to vast new possibilities and provided me with a new direction in my career. Since then I have continued to learn, grow, and achieve my goals. I have attended numerous educational seminars, trained with experienced integrative medicine doctors, and continue to stay updated in new advances in this field through journals, conferences, and various other sources. I am also a member of AAFP (American Academy of Family Practice) and ACAM (American College for the Advancement of Medicine). I strongly believe in preventive heath care. Our health is our most valuable possession and asset, important in all its dimensions - physical, mental, and emotional. I am committed to working with my patients at their own pace and helping them attain their optimal health goals. It gives me immense professional and personal satisfaction to know that this type of holistic care may greatly enrich the quality of their lives.